TBL 31 is ready to go – as you can see there is a revised standard cover. 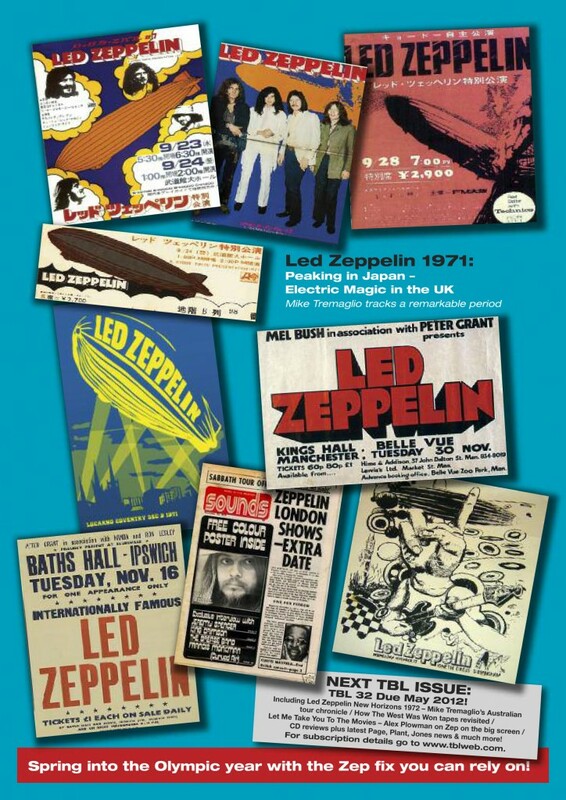 Having the recent opportunity to feature a rare Led Zeppelin photo from 1971 as the main cover photo for TBL 31, we have decided to produce two runs of the magazine for this issue – the aforementioned Zep design alongside the already previewed Roy Harper & Jimmy Page version. 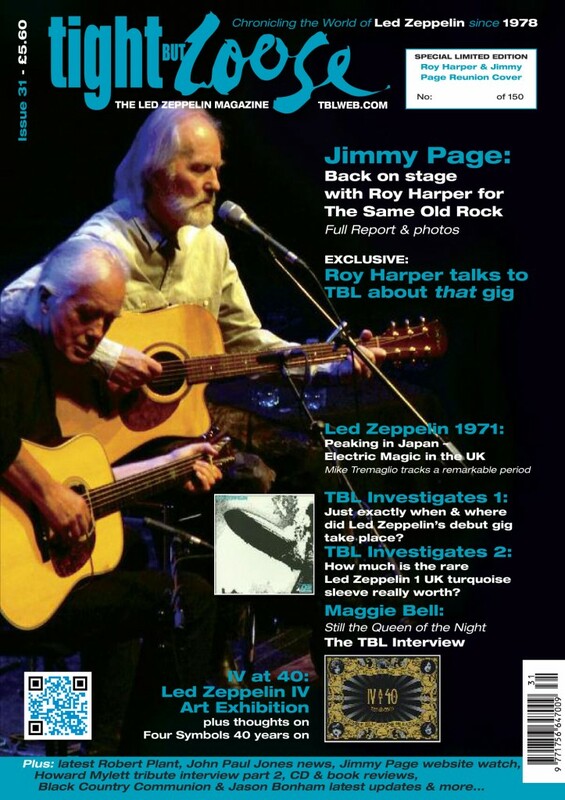 So for TBL – issue 31, we are also producing a special strictly limited edition Roy Harper & Jimmy Page reunion collector’s cover edition. 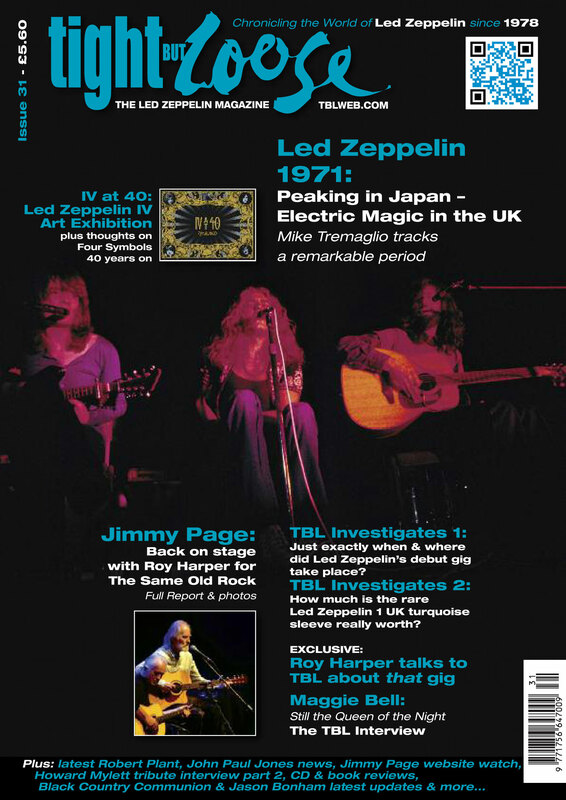 This will feature an alternate cover to the standard issue – on the front, a photo of Roy Harper and Jimmy Page at last year’s Royal Festival Hall by Ian Avey, whilst the back cover has a collage (exclusive to this version only) of rare images representing the Japan and UK fall 1971 dates as chronicled in the magazine by Mike Tremaglio. This unique cover comes in a limited edition run of just of 150 – – each of them individually numbered. Please note: This is an additional offer to the standard issue which has a Led Zeppelin photo as the main image on the front and the standard TBL back cover offers text and the same text content inside. Subscribers will receive this standard edition as part of their 2011 subscription. The TBL 31 collector’s cover edition is an additional purchase. I am sure ardent TBL collectors will want to invest in this unique collector’s cover edition. Demand is sure to be high, and once they are gone – they are gone. The links to order this special item are not yet live but will be shortly – keep an eye for full details on all this very soon. Dave, I just received my TBL and it’s a stellar production, there is nothing that compares to TBL for Zeppelin news and IS the “word” when it comes to Zep fans. Thanks for all of your work and dedication as well as Gary and all the others that make this treasure happen. Bloody great 1971 shot im deffo after that version. Jimmy’s website is noting that today (12 Jan) is the anniversary of LZ I’s release so folks, why not put it on LOUD and remind yourself (as if that were necessary) why we’re all here…! Can’t wait for TbL 31…cheers chaps!